Today in Masonic History George Middleton passes away in 1815. George Middleton was an American soldier and civil rights pioneer. Middleton was born in 1735, the exact date and location is not known. Like 5,000 other African Americans, Middleton served on the side of the patriots during the Revolutionary war. He began his service in an integrated unit which would become the core of the Continental Army. Initially African American soldiers were brought into the Continental Army. This proved a controversial decisions and General Washington went back and forth as to whether new African American soldiers should be recruited and whether they should be in segregated units or integrated units. Eventually on the "national" level, it was decided to allow the recruitment of additional African American soldiers, this came though only after the British announced that any slave would earn their freedom if they fought on the side of the British. States were allowed to decide whether local militias were integrated or not. Records for African American soldiers during the Revolutionary War are incomplete. It is believed that Middleton achieved the rank of Colonel and was in command of the Bucks of America. The Bucks of America was one of two all African American militia units serving in Massachusetts during the Revolutionary War. Middleton is the only member of the Bucks of America who is known by name. It is believed that under Middleton the Bucks of America did not see any combat with British soldiers, instead they were deployed as an auxiliary police force in Boston. Most African Americans, including Middleton, and abolitionists of the time preferred integrated units as were more common in the New England states. After the Revolutionary War, Middleton, along with many other African Americans, began to form a small community of their own. It was called the North Slope of Beacon Hill in Boston. Middleton was one of the first to purchase land there. He and a friend built a home on Pinckney, which is now a stop on the Black Heritage trail in Boston. Middleton was a constant fighter in the cause of Civil Rights for African Americans. In 1796, he formed the African Benevolent Society which provided financial relief and job placement for members. The support was given primarily to widows and orphans. In 1808, Middleton along with Prince Hall, published an anti-slavery statement. It stated "Freedom is desirable, if not, would men sacrifice their time, their property and finally their lives in the pursuit of this?" This caused parallels to began being drawn between the American Revolution and the desires of African Americans. Middleton passed away on April 6th, 1815. Middleton was a member of African Lodge No. 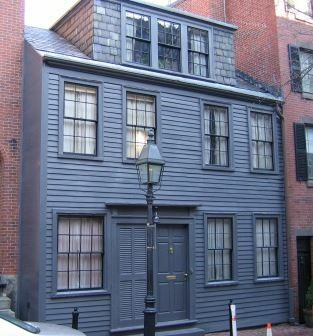 459 in Boston, Massachusetts.